I completely forgot about this. 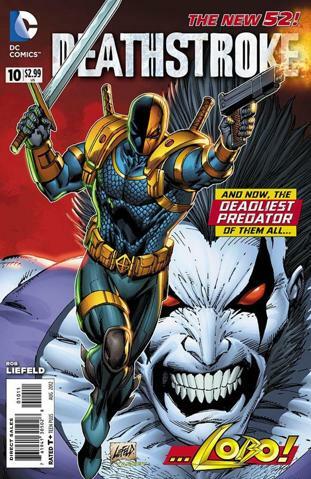 Deathstroke #10 is the second issue of writer/artist Rob Lifeld’s DC comics 1990s tribute series. Lobo is loose and running wild; the opening scene of him at a diner would make any longtime Lobo fan smile. It’s silly; something that is needed for a character like this. Deathstroke is investigating the prison that Lobo escaped from along with Zealot and the Omegas (who I think are the New 52-ized version of the Omega Men). After tussling with one of the aliens who had been serving as a warden at that jail, Deathstroke finds out that Lobo has been unleashed to kill off everyone on the planet Earth. The final scene has Lobo off at some top secret alien crash site in Colorado where he uncloaks a massive spacecraft. One can only assume that its filled with all kinds of weaponry and such. Lobo also mutters something about a Sheba, which I can only assume is a love interest for the frag master. I guess the next issue is going to be some sort of all action slugfest between Lobo and Deathstroke. I can’t think of anyone better suited to draw this kind of kinetic batle than Liefeld. This entry was posted in Uncategorized and tagged comics, dc, deathstroke, lobo, new 52, rob liefeld by Chris. Bookmark the permalink.